The next Super Hero Year project has finally been revealed and it’s Kamen Rider Amazons! No that isn’t a typo. 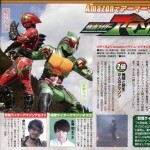 In fact we’re getting a special team up of 2 different Kamen Rider Amazons! The Red rider, Kamen Rider Amazon Alpha is based on the S.I.C. Hero Saga exclusive form of Pre-Amazon. A form which does not use the Gigi Armlet, is 1/3 as powerful as the full Amazon, and the user will die in 3 days if the armlet is not obtained. 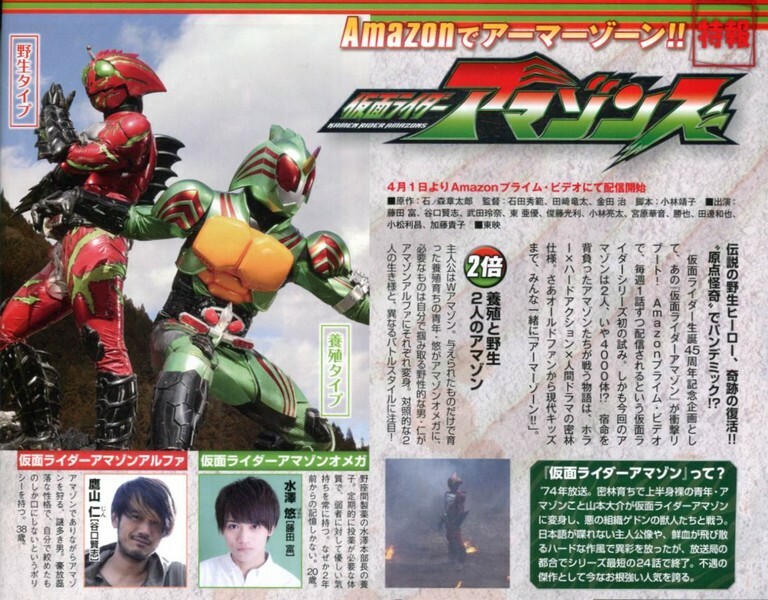 The Green one, Kamen Rider Amazon Omega appears to be a new rider entirely with a design aesthetic similar in nature to the recent Kamen Rider 1 film. Kamen Rider Amazons will apparently be a multi-part streaming net series that is appropriately enough, going to be available only via Amazon Prime in Japan. As more information becomes available, we’ll update this news story. Information will be released in 8 days. Silhouette of the next Rider on the list. If these big Kamen Rider summer movies are gonna be Showa Era throw backs, I can get behind them. Then again, I haven't seen Kamen Rider 1 yet so I can't say if it's a good thing or not lol. Yeah definitely looks like Amazon there. Interesting choice that they're going with him next. Defs looks like Amazon. Interesting choice, if so, all things considered...but I like him so hey, cool. His design was always one of the better ones. I hope a redesign can be at least as good as the original. If it really is a new Amazon flick than I am soooooo down for it. Oh my god new Amazon anything would be the best thing ever. I think it would be great if they gave Amazon a slight redesign. Mainly the belt IMO. I just didn't like the bike handles sticking out from it.